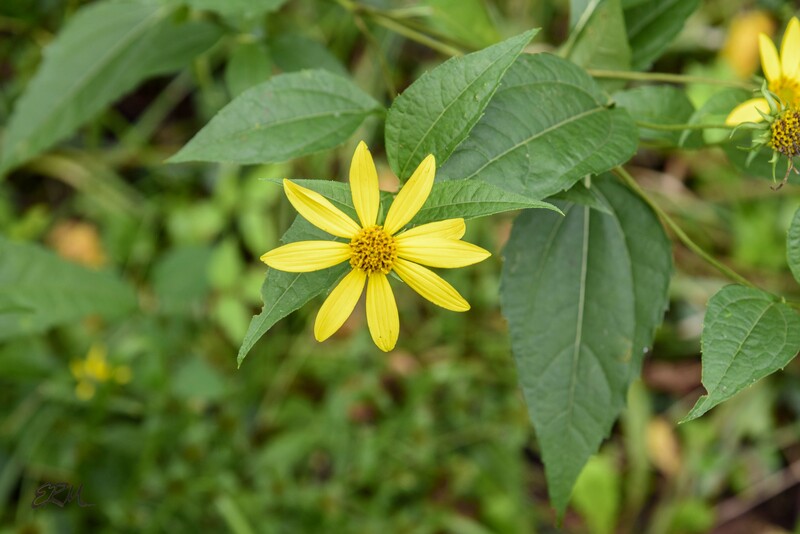 Last week when I drove to Lock 6 in search of the two Verbesina species, I was pleasantly surprised to find two Helianthus species growing in the same area. Sunflower species can be tricky to differentiate, but I’m fairly confident that these are H. decapetalus and H. tuberosus. Here’s a closer look at both. 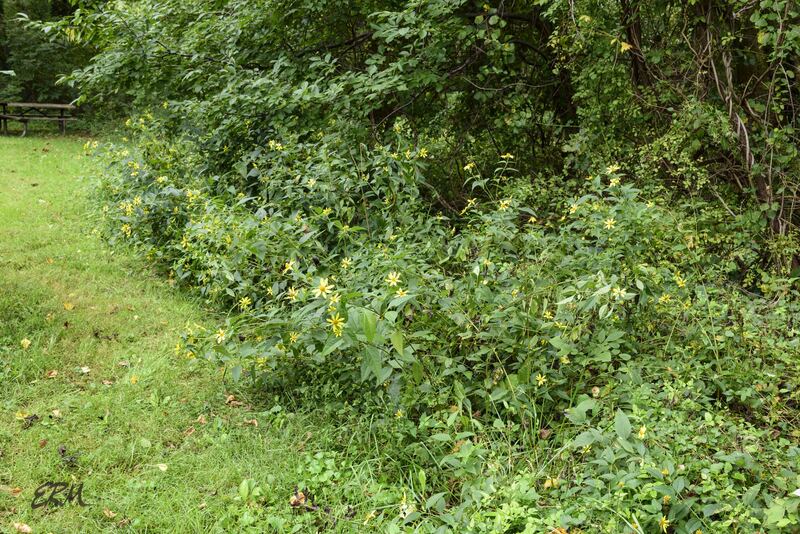 First thing to note is that these were likely planted here, and are growing in rather rough conditions (lots of foot traffic, dogs, invasive alien plants, lawn mowers), so neither stand is showing the plants at their best. 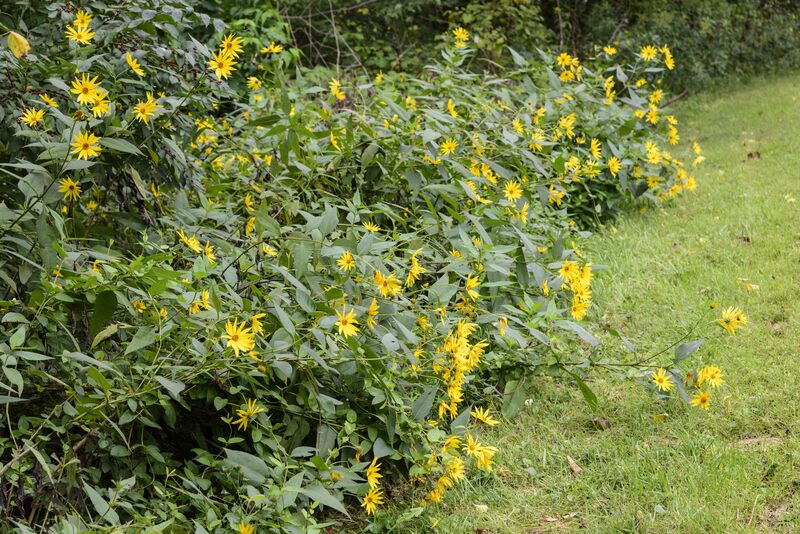 Depending on what source you consult, both thin-leaved sunflower (H. decapetalus) and Jerusalem artichoke (H. tuberosus) stand anywhere from half a meter to two meters tall. Many sources seem to agree that generally, the former is not as tall as the latter. 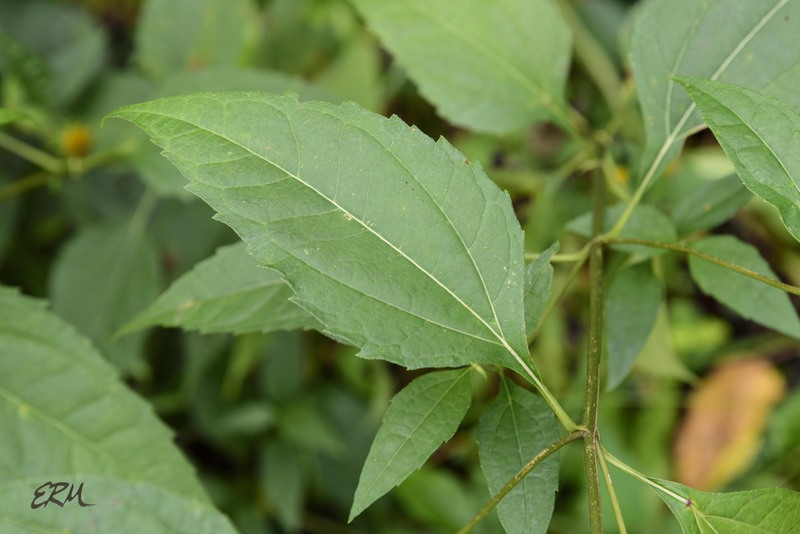 The leaves of each species look very similar. The largest leaves of H. tuberosus are usually somewhat larger than the largest leaves of H. decapetalus, but keep in mind that there is a lot of morphological variation in Helianthus species. 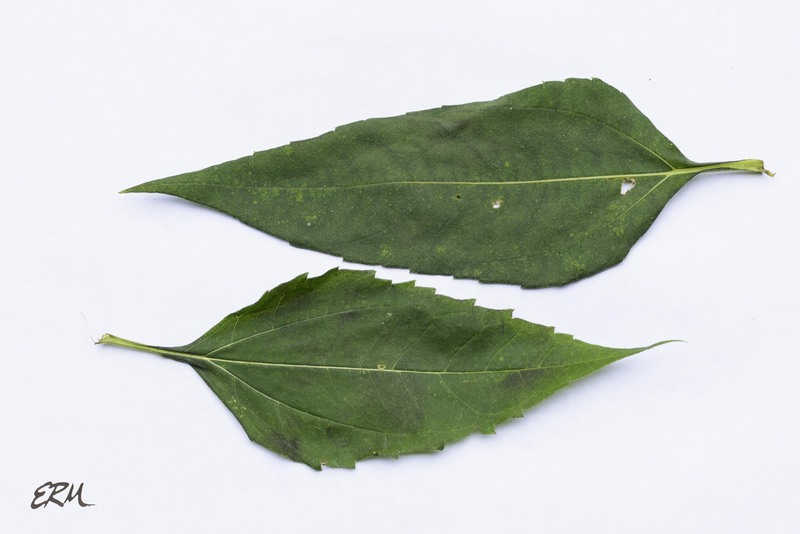 Note that in this picture, the H. decapetalus leaf has more pronounced teeth, which is another general characteristic. Serrated margins like this are best observed on lower stem leaves. 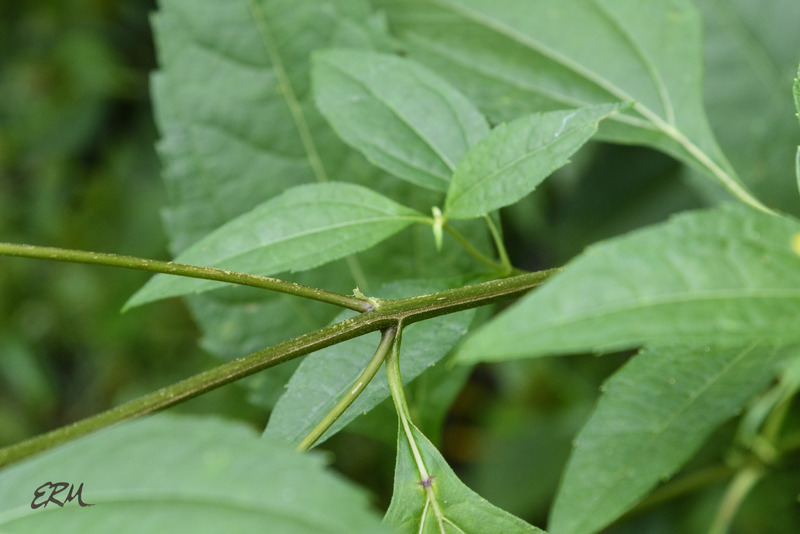 Also, note that both leaves are winged to some extent. 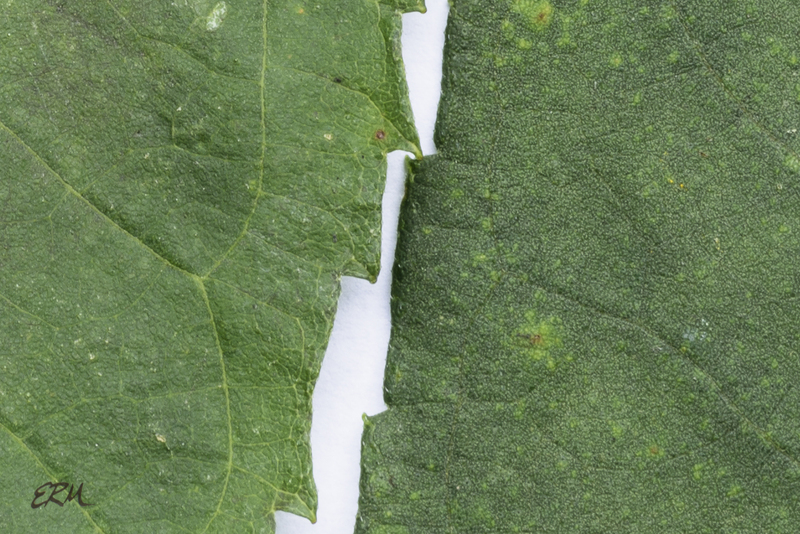 Both leaf margins and presence of petioles are characteristics that can vary widely, even on the same plant. Another, more obvious difference is seen in the stems. H. decapetalus stems are mostly smooth, maybe with a few short hairs. H. tuberosus stems are covered in short hairs that stick straight out. About the flowers… Clearly they look a bit different. Don’t let the specific epithet decapetalus fool you, because this species does not always have ten ray florets (“petals”). It will usually have about ten rays, though. H. tuberosus has about ten to twenty, though some sources say as few as six and as many as twenty-five. In these two populations, the ray florets look a little different, a little wider and rounder on H. decapetalus, and a little longer and narrower on H. tuberosus. 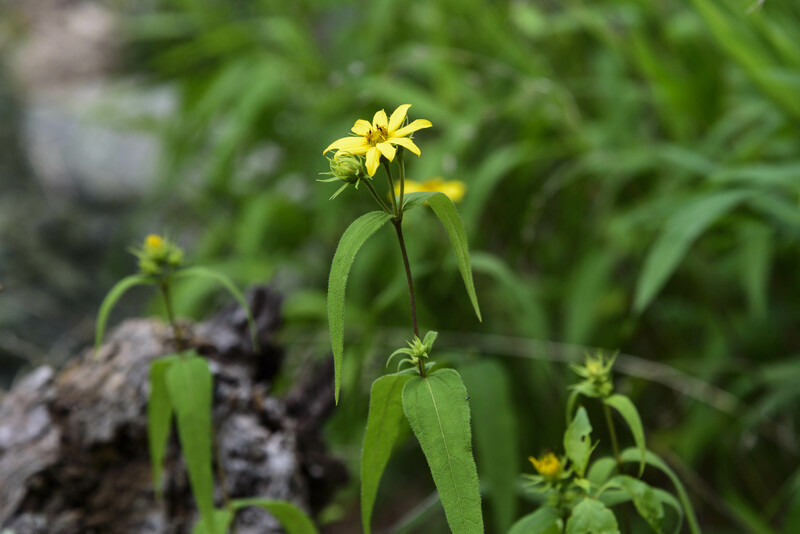 As with the verbesinas in my last post, I caution you against using any one characteristic, or any one flower head or leaf, or any one section of stem, to determine the identification. 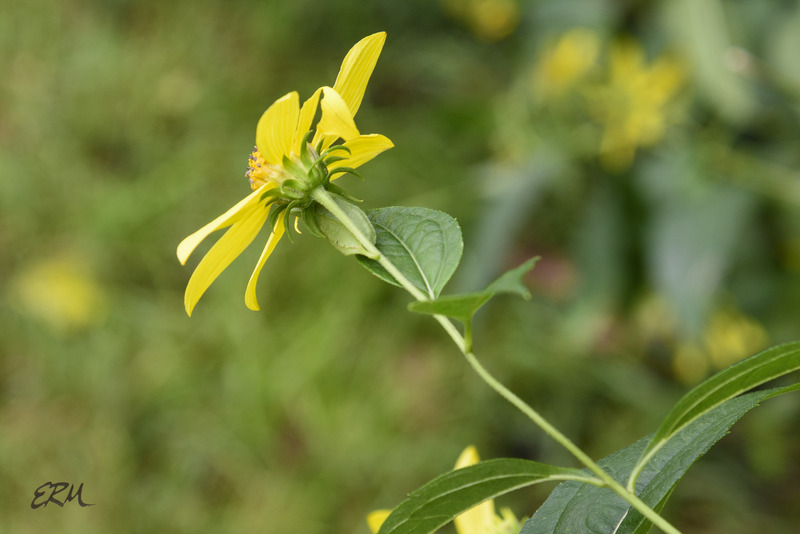 You really need to look at the entire plant – several leaves, several flower heads, several stem sections – to be sure. Helianthus identification is fraught with peril. It’s highly likely that I have H. tuberosus here, but there is one other Helianthus in this area that has hairy stems: H. hirsutus. 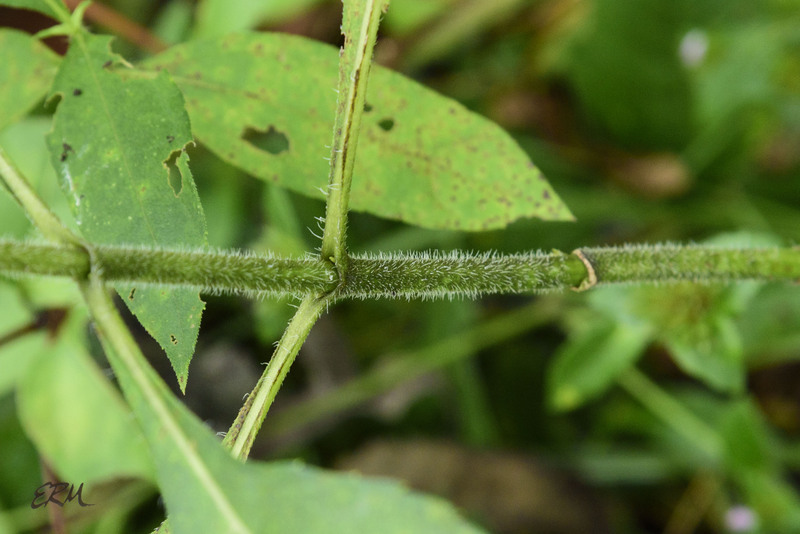 These two look similar at the stem, but the latter species has much longer and narrower leaves, which are either sessile or with very short petioles. H. hirsutus is listed S1/highly state rare in Maryland. I’ve never found it, so I can’t share any pictures to illustrate the point. 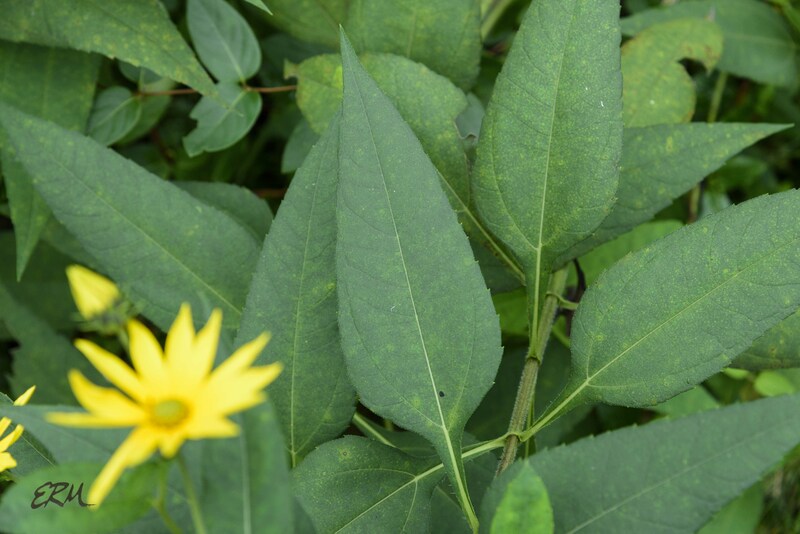 Another tricky ID involves H. strumosus (pale-leaved sunflower), which is hard to distinguish from H. decapetalus. The major difference is seen in the phyllaries (aka involucral bracts) on the underside of the flower head. In H. strumosus, they don’t usually spread out past the width of the disk of the flower head, while in H. decapetalus, they do spread beyond the disk. I’ve never seen H. strumosus. The picture above shows the involucral bracts of H. decapetalus. 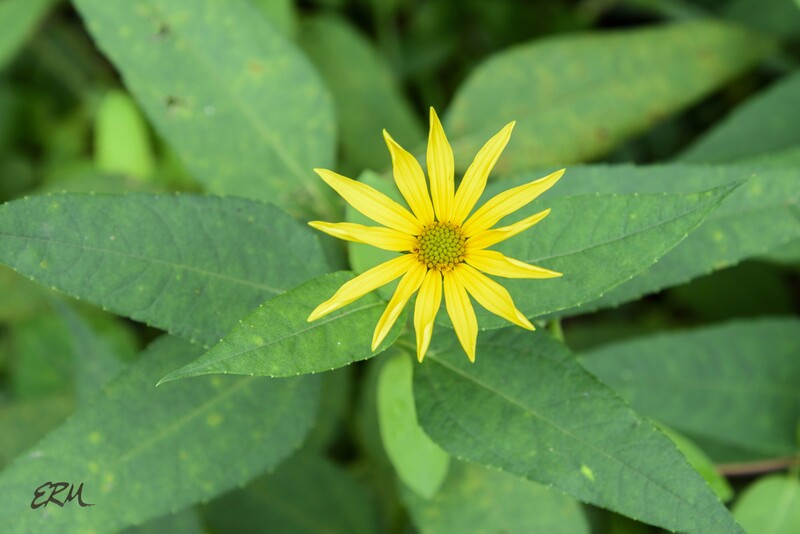 Here’s one more Helianthus, just for fun: H. divaricatus (woodland sunflower). The differences should be obvious. This entry was posted in Uncategorized and tagged Asteraceae, Helianthus, plant ID, sunflowers by elizabeth. Bookmark the permalink. Does anyone really know which species is the state flower of Kansas? It is only designated as ‘sunflower’. It is like the yucca of New Mexico. No one really knows which one it is.